You may have been concerned that I had not posted this year’s Back to School Teacher Emergency Kit, but fear not, I would not let you down. 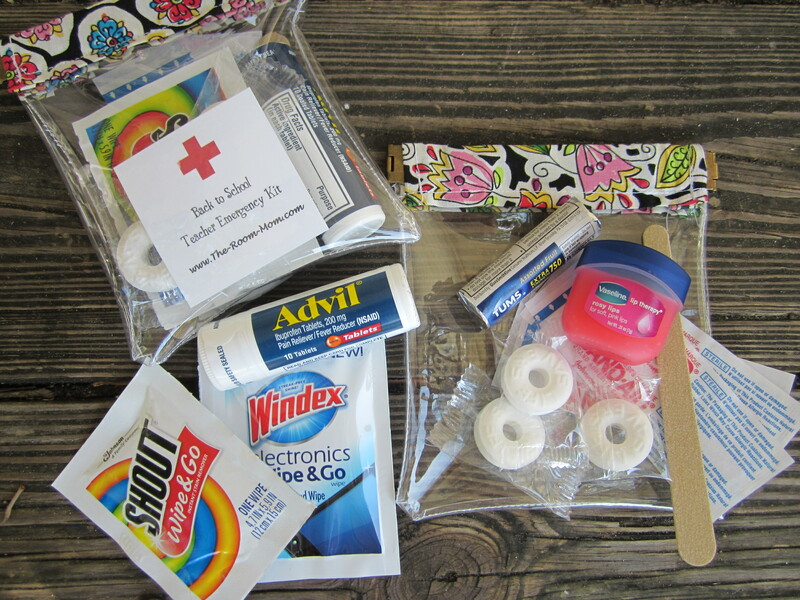 If you recall, the Teacher Emergency Kit is my favorite first day of school gift to a teacher, and I have been delivering them since my children entered elementary school. Now that my kids are getting a little bit older, it is more important that I keep this tradition going because teachers of older students always get jipped in the teacher gift department. This year’s emergency kit pouch is made of clear vinyl (possibly a poor choice when you sew in a climate with 8,000% humidity), and it reminds me of a small make-up bag. Like my previous kits, it is supposed to be a handy little bag to store in a desk or teacher bag for daily emergencies. If you sew, visit BONJOUR QUILTS for the pattern and directions. You can register on the site to download a measurement guide to make bigger and smaller pouch sizes. I followed the sizes given in the blog post, and the finished bag is about 4″ x 5″. As you may have gleaned from my comment above, sewing with vinyl in hot and humid weather is not easy. I even had my special teflon sewing foot. I purchased the lightest gauge of clear vinyl available at Hobby Lobby. The FLEXIBLE FRAMES that create the opening at the top of the pouch are the same material that is in a metal measuring tape (or a slap bracelet). I ordered the flexible frames online because I could not find them in any store locally. My sewing store told me that I could cut a measuring tape into the pieces I need and slide them into the fabric sleeves as a back up idea if I couldn’t find the frames. Use a bead box from a store like Michael’s Crafts. Sew a potholder clutch or foldover cloth bag. 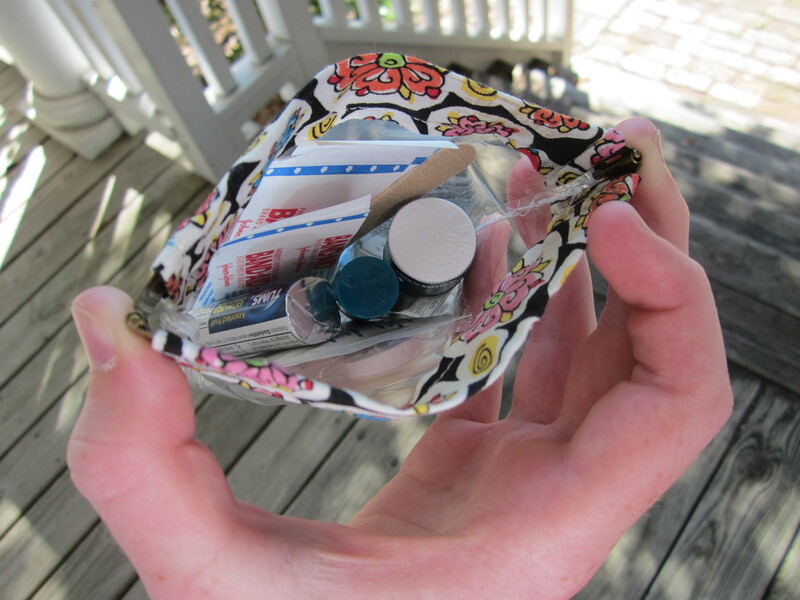 Pick up a small cosmetics bag; I saw some in the bins near the door at Bed, Bath & Beyond. Fill a simple paper gift bag. 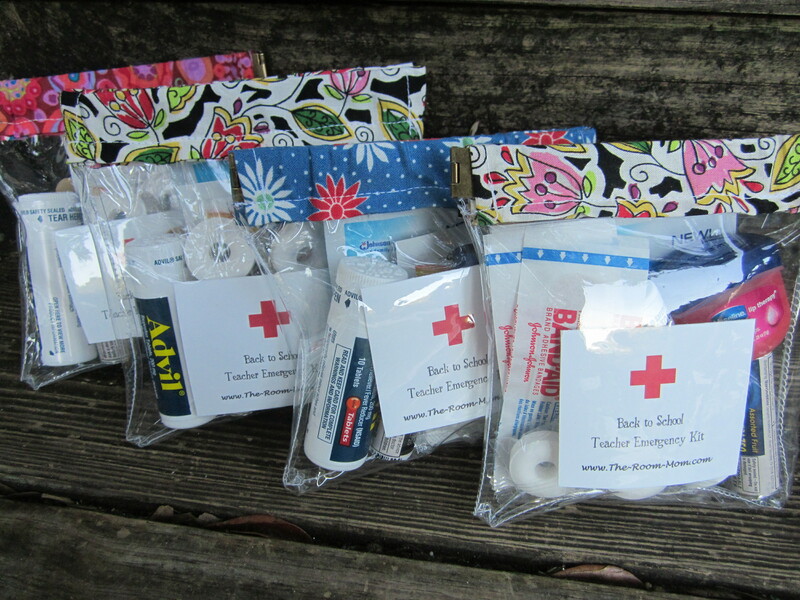 Click on the images below to read about other versions of the Back to School Teacher Emergency Kits! You are so thoughtful! I’d be happy with chocolate bar. I do chocolate bars too! I’ve got to keep the teacher troops happy!